If you’ve ever nudged a plant and been greeted by a cloud of tiny white flies then you’ve encountered a loathsome insect that isn’t actually a fly at all. The whitefly belongs to the Hemoptera Order, and so is cousin to aphids, leafhoppers, and mealy bugs. There are over 1,000 types of whitefly, but they all exhibit similar pestilential lifecycles and eating habits that make them dire enemies to gardeners, farmers, and landscape-minded homeowners. Whitefly adults feed by tapping into the veins of plants and sucking up the juices (phloem sap). They also secrete a disgusting, viscous slime called “honeydew” that attracts hosts of other insects that sometimes kill the whitefly’s natural predators, creating a more profound, multi-faceted infestation. When the honeydew spoils, it produces various molds dubbed “sooty mold” that further burdens plants and hinders photosynthesis. Not angered deeply enough to commit mass insect murder? Whitefly adults often lay eggs while feeding, moving in a circle around the plant vein, creating spirals of eggs. The eggs hatch and the ghastly nymphs find a spot to feed and further drain the plant’s resources until they reach adulthood. Whitefly infestations can kill gardens and crops just by draining the juices, but they also spread plant viruses which have cost many states untold millions of dollars in agricultural losses. Heard enough? Good, for now we hunt the whitefly. However, getting rid of whitefly populations isn’t easy. 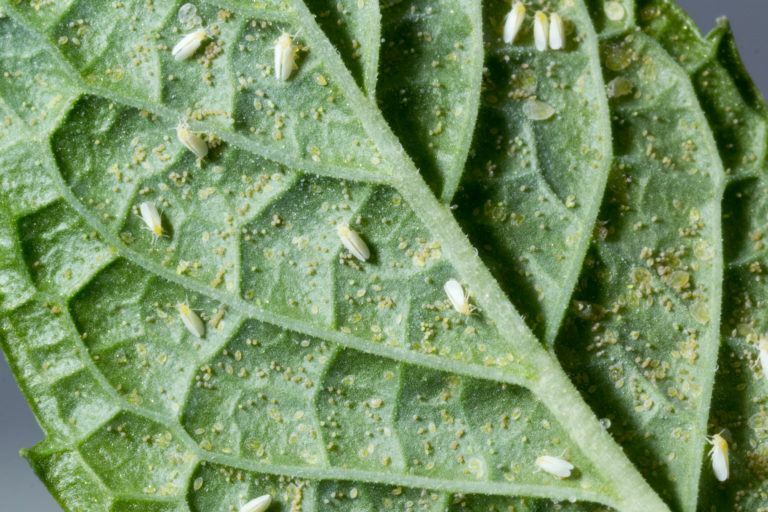 Each of the whitefly’s four developmental stages is resistant to different tactics. Killing whiteflies often takes an integrated pest control philosophy – looking into prevention, traps, biological warfare, poisons, and even manually nabbing the jerks. Dark deeds await! Whitefly populations grow exponentially; small numbers lead to whitefly infestations in a matter of weeks. An adult female whitefly can lay up to 300 eggs in her two-month lifespan. In warm conditions, those eggs can go through all four of their revolting developmental stages and be ready to lay more eggs in as little as half a month. 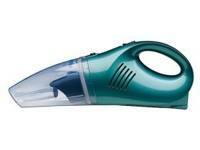 A small hand vacuum is ideal for getting rid of whitefly populations in gardens and greenhouses. Like myself, the whitefly adults are sluggish at dawn. Simply walking around vacuuming your plants can prevent whole disease-ridden generations from being hatched. The vacuum will also get rid of whitefly eggs, crawlers (second stage) and the immobile nymphs that aren’t stuck via secretions. Make sure to vacuum under leaves and foliage. After you’re finished, place the vacuum bag inside another plastic bag and put your victims in the freezer. As the door shuts, rejoice to the sound of plant cheers and whitefly screams. 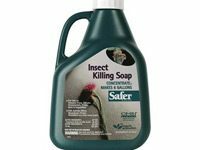 Safer Brand’s Insect Killing Soap will get rid of whiteflies without killing off insects beneficial to your plants. This gentle whitefly killer is made from potassium salts and fatty acids. The salts strip away the protective layering present in the whitefly’s immature stages, and the acid will kill them and adult whiteflies. The soap also leaves a residue that creates difficulties for whiteflies trying to land and attach to plants. It is OMRI (Organic Materials Review Institute) listed for organic gardening, so you can feel nice and green about killing your whiteflies. Plus, you can get 16 oz of Concentrate on Amazon, so you can save some cash and time too. Bring in the whitefly’s natural enemies. Many whitefly infestations occur because its predators are not found in the area, or, more commonly, they have been inadvertently wiped out by pesticides. 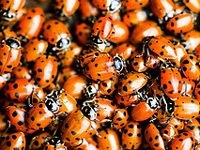 Ladybugs love eating whiteflies and they are very cheap. Encarsia Formosa is a tiny, parasitic wasp that preys on the greenhouse whitefly. Delphastus pusillus is another ladybird beetle that lays a few eggs a day on patches of whitefly eggs, and when they hatch they’ll eat 1000 whitefly eggs a day, or a dozen large nymphs. There are dozens of commercially available, garden-friendly predators of the whitefly and its soft-bodied, Hemoptera kin. Do some searching around for insect henchmen that suit your needs. From online vendors, you can buy small for private gardens, or you can purchase vast armies for large greenhouses and agricultural purposes. Then, unleash hell upon the whiteflies. 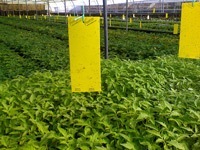 Greenhouses and gardeners can get rid of whiteflies using sticky traps. The whitefly is attracted to yellow with the same urgency that ninjas are attracted to shadows. During infestations, experts suggest placing one trap for every two plants. You can stake these traps at plant level or hang them from a branch. When changing or cleaning the sticky traps, you’ll be able to see if your whitefly infestation is getting better or worse. You can purchase yellow whitefly sticky traps at gardening stores or make your own using thick yellow paper and petroleum jelly or motor oil. Companion plants like nasturtiums and both French and Mexican marigolds can help you get rid of whiteflies. The whitefly and its ilk cannot tolerate the smell of these flowers. 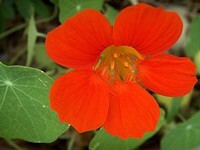 After some research, I have become enamored with nasturtiums (tropaeolum), as they come in several varieties, are easy to grow, support blindingly bright blooms, attract armies of beneficial insects, and even if you have the yellowing, wilted-thumb-of-plant-death, they will grow. The entire plant – even the flowers – is edible and delicious. They produce seeds (also edible), so you’ll never have to make another purchase. Truly, these flowers will beautify your landscape and repel whiteflies. The problem with using insecticides to kill whiteflies is that the whitefly is extremely resilient, and they quickly develop immunities to even the most devastating chemicals. Imagine if the Russians had nuked the United States during the cold war, only to find they made the Americans taller and bullet proof. If you don’t wipe them out, you have created super whiteflies that will travel to your neighbor’s farm/garden. Avoid pesticides when you can. 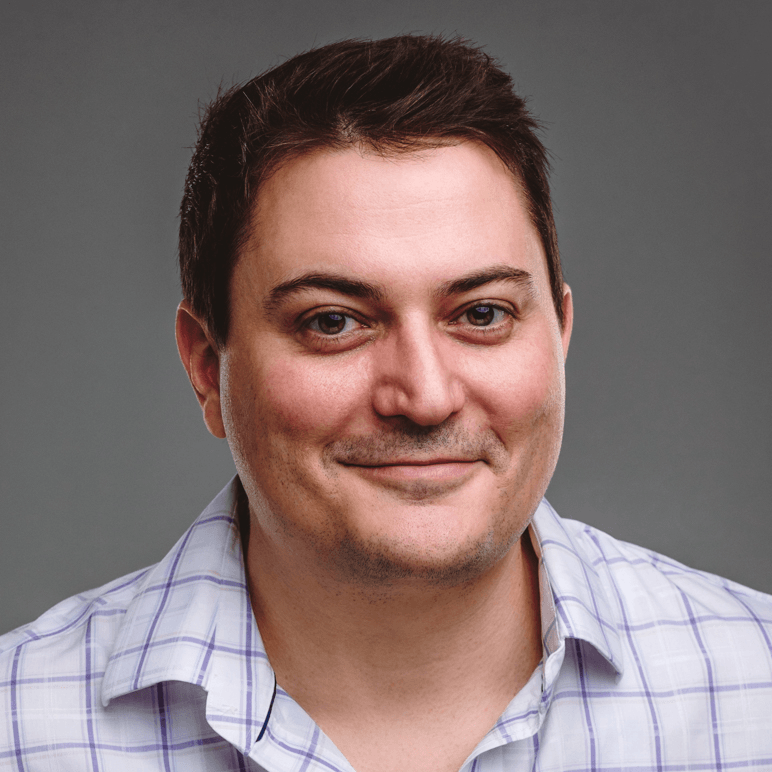 If you think I’m some hippie who is always thinking green solutions, you’re wrong – the green solutions just happen to be the right ones in this instance. Just ask the state of California. Their crops were being devastated by whiteflies in the mid to late nineties, and pesticides just seemed to embolden the pale fiend. They invested heavily in biological controls in the form of parasitic wasps. The whitefly problem has now long been under control. Birds love to gorge themselves on whiteflies, but our feathered allies are particularly choosy when it comes to real estate. You’ll need to satisfy a bird’s basic needs before they’ll help you out. They need food, shelter, and water. Hummingbirds, purple martins, and chickadees love eating whiteflies, but then again, many birds do. Find out about the birds in your area. This water wand is surprisingly effective against aphids and whiteflies. It “blasts” 360 degrees of water, stunning whiteflies and removing their young from underneath leaves, saving plants and your back. You and your green friends will get some water, and the whiteflies will find justice. This is a proven way to repel whiteflies from gardens, greenhouses, and large scale agricultural operations. You can buy reflective mulch from gardening stores, but I would make sure it is permeable (not all brands are). You can simply place wide sheets of aluminum foil around plants. As it grows large, the foil will stop being effective, but the plant will already be hardy enough to survive most pests. Neem oil has long been used as an organic alternative to harsher pesticides in gardens and on large farms. It isn’t harmful to plants, animals, or beneficial insects, but it will kill whiteflies, aphids, and mites. You’ll want to spray for at least four to five weeks to ensure death for every stage of whitefly development, and be sure to hit the undersides of lower foliage. You can get a jug of Natria Neem Oil from Amazon. Fruit Flies: Get Rid of Them!